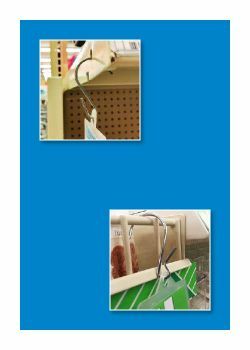 "Strip Hook Open Ended" and "Strip Hook Pinched"
S-Hooks are the most popular way (not the only way) to hang Clip Strip ® Merchandisers off displays, racks and shelves. 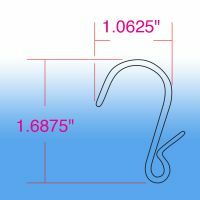 We manufacture two different kinds of S-Hooks that work best for these purposes, the SH-75 and SH-50. The SH-50 has an open ended hook, it works best when loaded onto the strip right at retail. Our other recommendation, especially if you are pre-loading the strips, is the SH-75, which has a pinched hook and is securely fastened to the strips and will not come off during shipping. In certain circumstances, although it’s not standard, our SH-100, have also been used to hang display strips when it works for the end user. Our recommended strip s hooks are all metal s hooks, if unsure what version is right for your needs go online and ask for free samples. 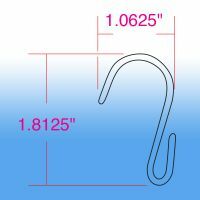 If you are confident in your needs, buy s hooks in bulk to enjoy significant quantity discounts or even when purchased at lower quantities, our prices are always affordable. If you require S-Hooks for needs other than for strip hanging. we carry a few other versions here. Clip Strip Corp. knows strip hangers, let us be your go-to provider of S Hooks and other strip hanging accessories.